Manhattan lost both a literary and a musical landmark when the Algonquin Hotel’s fabled Oak Room was shuttered at the beginning of the year. This delightful hour of songs and patter, typifying the sophisticated fare that was the room’s stock-in-trade for decades, was one of the last, if not the last, shows recorded there, captured during a three-week springtime run in 2011. 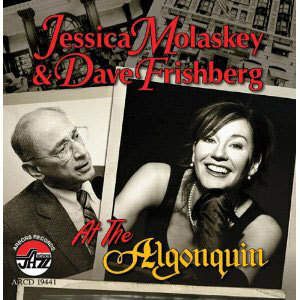 Though Jessica Molaskey is best known for swapping quips with husband John Pizzarelli, pianist and vocalist Dave Frishberg has been her frequent sparring partner over the years, and their silk-and-sandpaper rapport is every bit as engaging. The playlist is, with one exception, pure Frishberg, showcasing his skill for delectably clever wordplay (“I’m Hip,” “My Attorney Bernie,” “I Want to Be a Sideman”) and his equally estimable ability to craft tender ballads (“Heart’s Desire,” “Listen Here”). Frishberg devotees will be particularly charmed by two recent additions to his songbook, both drawn, appropriately enough, from The New Yorkers, a musical about Dorothy Parker, Robert Benchley and other acid-tongued members of the Algonquin’s notorious Round Table. “Will You Die?,” performed by Frishberg, wittily chronicles Parker’s various failed attempts at suicide while “Excuse Me for Living,” superbly enacted by Molaskey, serves as Parker’s tragicomic riposte. For their sole venture beyond Frishbergia, the duo chooses Johnny Mercer’s “My New Celebrity Is You,” adding extra choruses that salute their own circles of celebrated intimates, including Bob Dorough, Blossom Dearie, Michael Feinstein, Diana Krall and, of course, Pizzarelli.